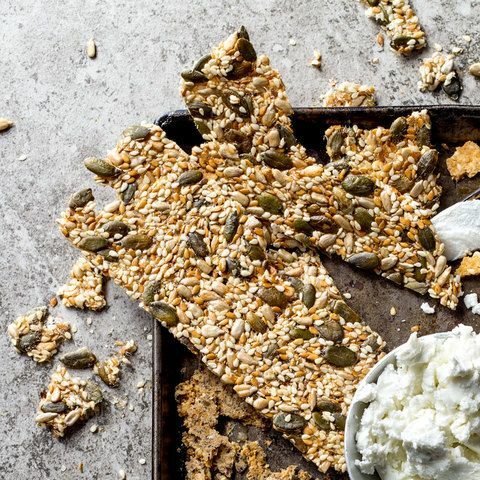 Seed crackers are the perfect alternative to your standard bread crackers. Preheat your oven to 150°C. If you have a fan oven, make sure the fan is on. In a mixing bowl, combine all of the ingredients and leave the mixture to stand until it is thick and pliable, about 10 or 15 minutes. Spread the mixture out as thinly as possible on a baking tray lined with a silicone mat or baking parchment (silicone paper). You may need two trays. The mix should have no holes in it. Bake the trays for an hour, checking them every 15 minutes. You may need to rotate them away from the hot spots in the oven. They usually take about 1 hour 20 minutes to cook. Once they are lightly browned and crisp take them out of the oven and leave them to cool. Once cooled, break them into any size you like and store in an airtight container.